I love this story of the Native American/African American sculptor who created despite living in racially charges times. Your students will be intrigued and amazed. Author Harness tells the reader that the”Old Patent Office Building” is now used to house the Smithsonian American Art Museum and was also the site of Lincoln’s inauguration ball. Explore the history of this building and its many uses, from Patent Office, Civil War Hospital and more. Check out this article from Smithsonian Magazine for an overview, and then pair this Minute with Andrea Warren’s “How to Interview an Historic Building” and have the students write some interview questions for the Patent office building. 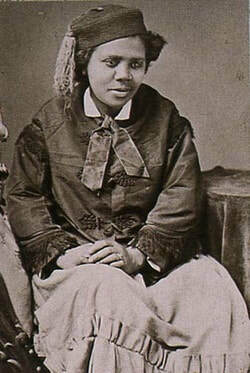 People of African American and Native American ancestry are referred to as “Black Indians” in the us, and Edmonia Lewis shares this unique heritage with several other notable Americans, like Crispus Attucks, the first casualty of the Boston Massacre. Have students explore this history of interaction between these two populations, including the complicated history of slave-owning Native Americans. Ask your students to identify every place mentioned in this Minute and then locate those places on the globe. Who can come up with the longest list - and find those places? Your students will get a little trip through the eastern part of the US with two more continental stops and a little island sun! How many countries did they find? Continents? States? Cities? Use this Minute to spark curiosity about the sculpture medium of visual art. Explore through Google Arts and Culture site using the pull-down menu. Or do a site search for African American sculptors [site:https://artsandculture.google.com african american sculpture artists] and let them explore. Send your students to the Smithsonian American Art Museum to explore the two connections to this Minute - the sculptures of Edmonia Lewis and the building the museum where the museum is housed. Check out the National Portrait Gallery, too - another gem housed in the Old Patent Building.